O.P.M.S. Green label Liquid Kratom is concentrated liquid Kratom. O.P.M.S. 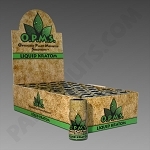 Green Liquid Kratom Concentrated 8ml Bottles come in 45ct display box.